Citation: Najam A, Awasthi LP, Verma HN. Ecofriendly management of natural infection of viruses in papaya (Carica papaya L.) by phytoproteins, isolated from B. diffusa and C. aculeatum, alone and in combination with bioenhancers. Virol Res J. 2017;1(2):6-15. Papaya (Carica papaya L.) of family Caricaceae is a highly valued economically important horticultural crop because of its edible fruits and presence of proteolytic enzymes-papain and chymopapain [1,2]. The cultivation of papaya is badly affected due to infection of a large number of viral diseases . These include papaya ring spot virus , papaya mosaic virus , tomato spitted wilt virus  and tobacco ring spot virus . Out of these diseases, papaya ring spot and papaya leaf curl are major diseases in India [1,2,7,8,9]. Plant viruses are a major cause of concern among Agriculturists because of their economic impact on crops they infect. To reduce losses, scientists have explored several strategies to control virus infection [10,11]. Since the majority of viruses infecting papaya are transmitted through insect vectors, therefore vector control is considered as one of the best approach followed by exploitation of inducible defense in plants which is receiving much attention by researchers [1,2]. Though majority of vectors can be managed effectively by the use of insecticides, the process is costly and is likely to cause environmental operational hazards. A large number of higher plants of different taxonomic families have an ability to resist virus infection [12-14]. A few of them are known to contain endogenous proteins that act as antiviral agents [13,15-20]. In the present communication efforts have been made to manage the natural infection and spread of commonly occurring viruses on papaya through phytoproteins, isolated from roots of B. diffusa and leaves of C. aculeatumplants, alone and also in combination with modifiers/bioenhancers. Phytoproteins from the leaves of Clerodendrum aculeatum L and roots of Boerhaavia diffusa L. were extracted following the procedure as described earlier [17,18,21]. The healthy fresh leaves of Clerodendrum aculeatum L were harvested from vigorously growing plants and ground (1:2, W/V) in 0. 2 M phosphate buffer (PB) of pH 6. 6 containing 0.1% β mercaptoethanol. The pulp obtained was then squeezed through double-layered muslin cloth. The extracted sap was centrifuged at 8,000 g for 10 minutes to remove the cell debris. The pellets were discarded and the supernatant was collected for further experimental work. Each experiment was replicated at least thrice to confirm its validity. The roots of B. diffusa, collected from profusely growing robust plants in the field, washed with water, cut into small pieces and dried under shade were ground to fine powder in a grinder. The root powder was then mixed/soaked (1g/10 ml) in 0.2 M phosphate buffer, pH 6.6 containing 0.1% β mercaptoethanol and l`eft overnight at 4°C. It was then filtered through two folds of muslin cloth and the filtrate so obtained was centrifuged at 8, 000 g for 15 minutes. A saturated solution of ammonium sulphate (60%) was added to the supernatant with continuous stirring and left overnight at 4°C. A thick precipitate appeared within one hour. The mixture was then centrifuged at 5,000 g for 15 minutes so as to separate the precipitate. The precipitate was collected and the supernatant was discarded. The precipitate obtained was suspended in small amount of buffer [20 g fresh weight/ml of 0. 2M PB (pH 6. 6)] and then dialyzed against running water, in a dialysis bag, to remove ammonium sulphate, if any, and to obtain total protein fraction. The dialyzed protein fraction was either diluted as per requirement or was concentrated through freeze-drying. Lyophilized protein was stored at –20°C. A similar protocol was adopted for separating a protein fraction from the leaves of C. aculeatum also. For VIA work buffer used was sodium acetate, instead of phosphate buffer. Seeds of papaya were grown in earthen pots filled with compost and soil (1:2) and kept in an insect free glass house /wire net house under natural light conditions. Vigorously growing seedlings of papaya at 2-3 leaf stage were used for experimental purposes. The dialyzed total protein fraction was diluted suitably with distilled water (1:2, C. aculeatum; 1:5, B. diffusa) and the aqueous fraction of phytoproteins alone or mixed with bioenhancer was sprayed, with the help of a pneumatic hand sprayer, onto the upper surface of the leaves of papaya plants. To evaluate the efficacy of phytoprotein mediated resistance under field conditions, fortnightly sprays with these phytoproteins were administered till the plants were in the susceptible phase. The experiment was first started in glass house condition and later on extended to open field in order to evaluate the efficacy of phytoprotein mediated protection under field conditions. The fruit yielding crop was transferred in separate beds that were arranged in randomized block design. The seedlings were transplanted (50 plants/bed) in nursery beds for experimental work. Weeds, if any, growing along the side of the bed were routinely removed to facilitate the free flow of virus vectors. The bioenhancer M9 was mixed at a strength of 4mg/ml to each of the phytoprotein isolated from leaves of C. aculeatum and roots of B. diffusa. The seedlings of papaya were sprayed either with an aqueous solution of (CA/BD) phytoproteins alone or a mixture of bioenhancer M9 and CA/ BD phytoproteins. A total of 10 sprayings were administrated at fortnightly intervals. Treatments with either CA alone or CA in combination with M9 and BD alone or BD in combination with M9 were administrated. The plants were sprayed regularly, at fortnightly intervals for a duration of about 5 months, especially when the plants were in the susceptible phase. Observations were recorded at 15 days intervals on disease incidence and also for plant growth parameters like plant height, number of leaves, flowers and fruits per plant. The data obtained were statistically analyzed for the significance of results . Observations on disease incidence were made weekly with respect to plant height, flowering and fruiting. Finally, when the crop was mature, fruit length, number of fruits per plant and other yield attributes were also included in assessing efficacy of phytoprotein. It is evidenced from the data presented in Tables 1-4 that the treatments of papaya with CA phytoprotein mixed with M9 was found to increase germination of papaya seeds besides improved vegetative growth of seedlings, significant decrease in disease incidence and symptoms severity in Carica papaya plants than CA phytoproteinalone (Plate 1 and Graph 1). Treated plants did not exhibit any disease symptoms but showed an increase in plant height (148% of control) and number of leaves/plant (135% of control). Disease incidence in treated plants was minimum (18%) as compared to control plants. The treated plants showed enhanced resistance against viral infection and better vegetative growth (Plate 1). Plate 1: Effect of phytoprotein, isolated from Clerodendrum aculeatum (CA) / Boerhaavia diffusa (BD) alone or mixed with bioenhancer M9 (L-Lysine monohydrochloride), on the germination of seeds of Papaya (Carica papaya L). Graph 1: Effect of M9 on the antiviral activity of phytoprotein isolated from Clerodendrum aculeatumon on vegetative and reproductive parameters of Carica papaya L.
*Data presented are the average of 20 replications. All the experiment was repeated thrice; after about 2 months of growth. Treatment involved 1 spray fortnightly of CA alone and CA +M9, M9=L-Lysine monohydro chloride. Disease symptoms due to natural virus infection in control plants of papaya exhibited severe ring spots on fruits, petiole and stems along with curling and rolling of leaves, followed by vein clearing and thickening. Enations also developed in the form of frills on green veins. The affected leaves became leathery and brittle and the petioles became twisted in a zig-zag manner (Plate 3). Only a few distorted small sized fruits, showing ring spots could appear on diseased plants. Such deformed fruits fell prematurely. A delay in symptom appearance with minimum disease incidence was observed in plants treated with CA phytoprotein mixed with M9 (Plate 2). Though some plants showed symptoms at later stages, the disease severity was very low as compared to controls. Reduced disease severity was observed in treated plants (Plate 2 and Table 2). The treated plants could reach at reproductive stage and showed very good flowering and fruiting (Tables 3 and 4). Significant increases was observed (Table 3) in number of flowers (142% of control), fruiting /plants (155% of control), number of fruit (173% of control) and total fruit yield (about 200% of control). Apart from this a better plant growth, plant height, number of leaves, flowering and consequent fruiting was observed in all replications of treated plots (Table 3 and Plate 3; Graph 1). 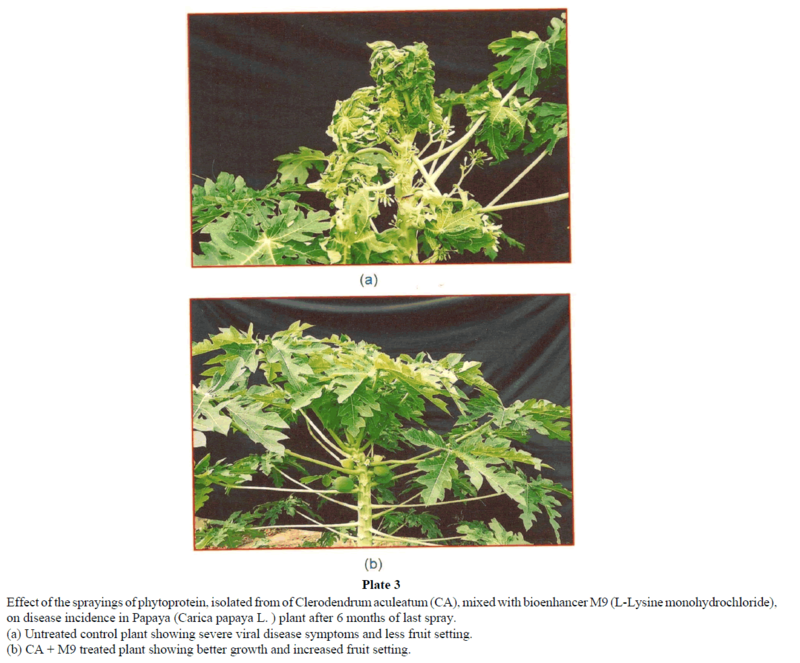 Thus, result showed increased fruit yield and better fruit quality (Plate 3; Table 4, Graph 1) in papaya seedlings sprayed regularly with CA phytoprotein mixed with bioenhancer -M9. Plate 2: Effect of the sprayings of phytoprotein from Clerodendrum aculeatum (CA) / Boerhaavia diffusa (BD) alone or mixed with bioenhancer- M9 (L-Lysine monohydrochloride), on disease incidence in Papaya (Carica papaya L.) plants. (a) Untreated /control plant showing severe viral disease symptoms at early stages. (b) CA + M9 treated plant showing better growth and no viral disease symptoms at early stages. (c) BD + M9 treated plant showing better growth and no viral disease symptoms at early stages. 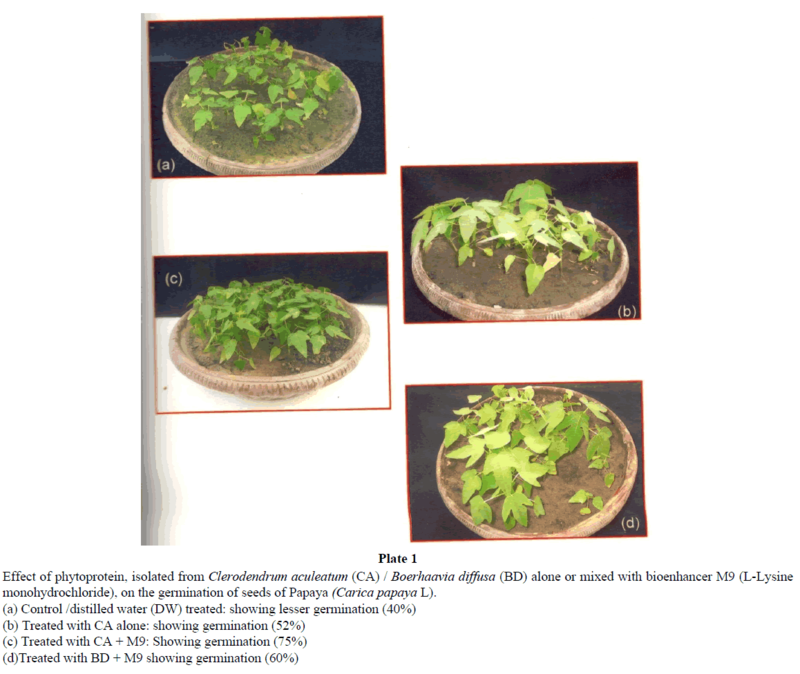 Plate 3: Effect of the sprayings of phytoprotein, isolated from of Clerodendrum aculeatum (CA), mixed with bioenhancer M9 (L-Lysine monohydrochloride), on disease incidence in Papaya (Carica papaya L. ) plant after 6 months of last spray. (a) Untreated control plant showing severe viral disease symptoms and less fruit setting. (b) CA + M9 treated plant showing better growth and increased fruit setting. *Data presented are the average of 20 replications. All the experiment was repeated thrice; after about 2 months of growth. The plants of Carica papaya, treated, since seedling stage, with BD phytoprotein mixed with M9 showed improved growth (Plate 2, Tables 5 and 6, Graph 2) than BD alone. Treated plants did not exhibit any type of disease symptoms. An increase in plant height (143% of control) and also in number of leaves (131% of control) was noticed. Maximum disease incidence with symptom severity was observed in control (untreated) plants of papaya, due to natural infection by papaya leaf curl virus and papaya ring spot virus. The treated plants showed enhanced resistance and vegetative growth (Plates 1 and 2). Graph 2: Effect of M9 on the antiviral activity of phytoprotein isolated from Boerhaavia diffusa on various vegetative and reproductive parameters of Carica papaya L.
Symptom, as a result of natural infection of virus in control plants of papaya, appeared in the form of mosaic mottling, curling and rolling of leaves, followed by vein clearing and thickening of leaf lamina. Leaf enations may appear, in the form of frills on green veins, at later stage or maturity. The affected leaves became leathery and brittle and the petioles became twisted in a zig-zag manner (Plate 2). Fruits setting on diseased plants were very poor, as only a few small-sized distorted fruits with ring spots could are seen. A delay in symptom appearance with minimum disease incidence was noted in plants treated with BD phytoprotein +M9 (Plate 2 and Graph 2). Significant increase was observed in number of flowers (133% of control), fruiting /plants (142% of control), number of fruit (161% of control) and total fruit yield (about 190% of control, Tables 5 and 6). Better plant height, number of leaves flowering and consequent fruiting was observed in all treated sets (Table 6). Thus, results showed increased fruit yield and better fruit quality (Table 6; Graph 2) in papaya plants sprayed, since seedling stage, with BD phytoprotein mixed with M9. Treatment involved 1 spray fortnightly of BD alone and BD +M9, M9=L-Lysine monohydro chloride. Virus inhibitors, of varied chemical nature, normally not present in healthy plants but are induced as a result of an unusual event [15,16]. Several hours or days have to pass before their inhibitory effect can be seen or measured [17,18,23-26]. The proteinaceous or glycoproteinaceous VIAs have been used successfully under field conditions for the management of a few viral diseases . Awasthi et al. reported that the glycoprotein from Boerhaavia diffusa can prevent 60 to 90 per cent of the virus infection of tomatoes, potatoes, pea and French bean. Verma  reported that the treatment with leaf extract of C. aculeatum followed by soil amendment with its dry leaf powder showed two folds increase in nodulation and grain yield along with 50 per cent reduction in disease incidence of mungbean yellow mosaic virus. Verma et al. reported C. aculeatum as a possible prophylactic agent against natural virus infection in mungbean plants. The inhibitory effect of B. diffusa and C. aculeatum may be due to resistance inducer present that induces strong systemic resistance against several viruses in hypersensitive as well as systemic hosts [24,28-31]. B. diffusa root extract may be attributed to blocking of host cell receptors or to interference of virus synthesis in the host cells. It is presumed that the inhibitor present in B. diffusa root extract and C. aculeatum leaf extract, when applied before virus inoculation, induced synthesis of translocable virus inhibitory or protective substances/proteins in the host plant [15,16,32]. The antiviral agents present in leaf extract of Clerodendrum aculeatum and root extract of Boerhaavia diffusa act as a protective agent against severe virus infections, has been established through the extensive work conducted by various workers [15,19,20,28,31,33-39]. The virus inhibitory potential of phytoprotein was demonstrated by the ability of phytoprotein to inhibit formation of necrotic lesion in local lesion hosts (hypersensitive reaction in a non-host plant) and in delaying the development of disease specific symptom in systemic hosts when the respective treated host plants were challenge inoculated with virus. This type of induction of resistance in plants has been referred to as induced systemic resistance (ISR). The application of agents responsible for ISR results in activation of various resistance mechanisms and this phenomenon has been called ‘Priming’, ‘conditioning’ or ‘sensitization’ . to these phytoproteins . These bioenhancers were found to increase the antiviral potential of extract or phytoprotein and also to increase the plant growth. The enhanced growth was reflected by substantial increase in height, leaf area, fresh shoot weight, fresh root weight, increased number of flowers and better resistance towards the development of systemic disease symptoms of viral infection. Similar findings were reported by Verma et al. . They reported that the potential of antiviral state in C. aculeatum phyto protein was increased when mixed with modifiers/bioenhancer (trypsin or papain). On the other hand, these bioenhancers were not much effective when used alone. The best results were obtained when M9 (L-Lysine monohydro Chloride) and M3 (L-Asparagine) were used as bioenhancer. Both these agents are proteinaceous and may have provided additional nitrogen upon their decomposition to the plants or to the microflora of phyllosphere. It has been shown that the non-pathogenic microflora lives mutuatistically with the plants and help to deter colonization of plants by pathogens. This argument also gets some support from the observation made with the effects of various concentrations of bioenhancers. Amongst the two, phytoproteins from C. aculeatum leaves were found to be more promising in combating viral infection. The same trend appeared when different bioenhancers were added to them. These experiments have provided clue to manage the viral disease to a greater extent by adding bioenhancer to the phytoprotein solution. Singh S, Jangre A, Kumar P, Awasthi LP. Studies on the molecular variability in Indian isolates of Papaya ring spot virus. Virol Res 2017a; (1)1:10-16. Singh S, Awasthi LP, Kumar P, Jangre A. Diagnostic characteristics of papaya ring spot virus isolates infecting papaya (Carica papaya L.) in India. Juniper on Line Journal of Immuno Virology. 2017b;1(4):1-7. Singh SJ. Viral and mycoplasma disease of papaya. In: Advances in disease of fruit crops in India, (S. J. Singh (ed.) Kalyani Publishers, Ludhiana pp. 1996; 275-296. Capoor SP, Varma PM. A mosaic disease of Carica papaya L. in the Bombay Province. Curr Sci. 1948;17: 265-266. Conover RA. Virus diseases of papaya in Florida. Phytopath. 1962;52:6, 1235-1238. TrujilloEE,GonsalvesD. Tomato spotted wilt in papaya. Phytopath. 1967;57: 9. Lambe RC. Terminal necrosis and wilt of papayas. J. Rio Grande Valley Hort. Soc,1963;17: 128-129. Dahal C,LecoqH,Albrechtten SE. Occurrences of Papaya ringspot potvirus and cucurbit viruses in Nepal. Ann Appl Biol. 1997;130: 491-502. Singh S, Awasthi LP. Survey, diagnosis and identification of resistant source of leaf curl virus infecting papaya (Carica papaya L.) in Ind. J. Virol. 2017;1(1):1-4. Singh SK, AwasthiLP, Singh S, SharmaNK. Protection of mungbean and urdbean crops against vector borne mungbean yellow mosaic virus through botanicals. Curr. Bot. 2011;2(2): 08-11. Singh S, Jangre N, Kumar S,Bisaria S, Awasthi LP. Effect of artificial and natural infection of papaya ring spot virus on different papaya cultivars in Uttar Pradesh. Jour. Soil and Crops: 2016;26(2):203-212. Awasthi LP. The purification and nature of an antiviral protein from Cuscutareflexa plants. Arch. Virol. 70: 215-223. Awasthi LP,Verma HN. Boerhaaviadiffusa – A wild herb with potent biological and antimicrobial properties. Asian-Agri History. 2006;10 : 55-68. Awasthi LP,SinghSP. Clerodendrum– A novel herb having broad spectrum antimicrobial properties. Asian Agri History. 2015;19(1): 33-44. Awasthi LP, Singh SP, Verma HN, et al. Further studies on the antiviral agent(s) isolated from host plants, pre-treated with Boerhaaviadiffusa glycoprotein. Virology and Mycology. 2013;3(1):124. Awasthi LP, Verma HN, Kluge S. A possible mechanism of action for the inhibition of plant viruses by an antiviral glycoprotein isolated from Boerhaaviadiffusa roots. J. Virology and Antiviral research. 2016;5(3)1-8. Verma HN, Awasthi LP, Mukerjee K. Induction of Systemic resistance by anti-viral plant extracts in non-hypersensitive hosts. J. Pl. Dis. Prot. 1979a; 87 (12): 735-740. Verma HN, Awasthi LP, Saxena KC. Isolation of the virus inhibitor from root extract of Boerhavviadiffusa inducing systemic resistance in plants. Cand. J. Bot. 1979b;57: 11214-17. Verma HN. and Baranwal VK. Antiviral phytoproteins as biocontrol agents for efficient management of plant viruse diseases. In: Biocontrol potential and their exploitation in Crop Pest and Disease Management (Eds. RL Rajak and Rajeev K Upathyay), Aditya Book Pvt. Ltd, New Delhi. 1999. Verma HN, Sivastava A, Gupta RK. Seasonal variation in systemic resistance inducing basic protein isolated from leaves of Clerodendrumaculeatum. Ind. Plant. Pathol. 1998;16:9-13. Verma HN, Chowdhery B, Rastogi P. Antiviral activity of different Clerodendrum L. species. Zeitschrift fur Pflanzenkrantheiten und Flanzcnchvtz. 1984;91: 34-41. Verma HN, Awasthi LP. Occurrence of a highly antiviral agent in plants treated with Boerhaaviadiffusainhibitor. Cand. J. Bot. 1980;58: 2141-44. Awasthi LP, Chowdhury B, Verma HN. Prevention of plant virus disease by Boerhaaviadiffusa inhibitor. Ind. J. Trop. Plant Dis. 1984;2: 41- 44. Awasthi LP, Kluge S, Verma HN. Characteristics of antiviral agents induced by B. diffusa glycoprotein in host plants. Ind. J. Virol. 1989;3: 156-169. Verma A, Singh RB. Clerodendrumaculeatum a possible prophylactic agent against natural viral infection in mungbean. Ann. Pl. Protec. Sc. 1994;2: 60-63. Verma A,Verma HN. Management of viral diseases of mungbean by Clerodendrum leaf extract. Indian J Pl. Pathol. 1993; ll :63­ 65. Gupta RK, Srivastava A, Verma HN. Callus culture and organogenesis in Boerhaaviadiffusa: A potent antiviral protein containing plant. PhysiolMol Bio Plant. 2004;10: 263. Singh S, Awasthi LP, Verma HN. Prevention and control of yellow mosaic disease of mungbean through aqueous root extract of Boerhaaviadiffusa. Indian Phytopath. 2004;57(3): 303-307. Singh AK, Najam A, VermaHN et al. Control of natural viral infection on okra (Ablemoschusesculentus) by root extract of Boerhaaviadiffusa. International Journal of Plant Protection. 2010;2 (2): 195-198. Srivastava A, Gupta RK, Verma HN. Micro propagation of Clerodendurumaculeatum through adventitious shoot induction and production of consistent amount of virus resistance inducing protein. Indian J. Experimental Biol. 2004; 42: 1200-07. Sharma NK, Awasthi LP. Molecular characterization of antiviral Proteins, isolated from host Plants, pretreated with antiviral glycoprotein, isolated from roots of Boerhaaviadiffusa plants. J of Human Virol and Retrovirol. 2017;5:1-5. Awasthi LP, Kumar P, Singh S. Incidence and symptomatology of cucumber mosaic virus in cucumber at farmers field of Faizabad district, U. P. Indian Phytopathol. 2006;59: 380. Awasthi LP, Singh S, Sharma NK. et al. Induction of systemic resistance through antiviral agents of plant origin against papaya ring spot virus disease in papaya (Carica papaya L.). International Journal of Sustainable Agriculture. 2011;3(2): 54-57. Awasthi LP, Singh SP. Eco-friendly management of the viral diseases of chilli (Capsicum annum L.). Research & Review: J. Agr. Sci. Tech. 2014;3 (1): 11-16. Singh AK. Comparative studies on control of certain ailments of plants, mice and cancer cell lines and in vitro stimulation of growth of plants and virus resistance using phytoproteins from Boerhaaviadiffusaand Clerodendrumaculeatum. Ph. D. Thesis, Lucknow University, Lucknow. 2006. Verma HN, Baranwal VK. Endogenous virus inhibitors from plants: Their physical and biological properties. In: Antiviral Proteins in Higher Plants, M. Chessin, D. De Borde and A. Zipf. Eds, CRC Press, BocaRaton, FI. 1995a;1-21. Verma HN, Baranwal VK. Agricultural role in endogenous antiviral substance of plant origin. In: Antiviral proteins in higher plants. M. Chessin, D. De Borde and A. Zipf. (Eds) CRC Press, BocaRaton, FI 1995b;23-37. Verma HN, Sivastava S, Kumar VD. Induction of systemic resistance in plants against viruses by a basic protein from Clerodendrumaculeatum leaves. Phytopathology. 1996;86:485-92. Chaubey AN, Awasthi LP, Singh SP. Eco-friendly management of viral diseases of potato. International Research Journal of Life Sciences, 2014;2(1): 8-12. ChaubeyAN, Mishra RS, Awasthi LP. Ecofriendly management of leaf curl disease of chilli through botanical biopesticides. Sci. Fed. Virol Res J. 2017;1(1), 1-7. Kumar D, Verma HN, Tuteja N, et al. Cloning and characterization of gene encoding an anti-viral protein from Clerodendrumaculeatum L. Plant Molecular Biology 1997; 33: 745-51. Verma HN, Varsha P. Prevention of natural occurrence of tobacco leaf curl disease by primed Clerodendrumaculeatumleaf extracts Pages202-206 in: Detection of plant pathogenes and their management Verma JP, VermaA, Kumar D(Eds) Angkor Publishers (P) Ltd. New Delhi (1995).